Playing hardball with the union was hardly unexpected. In a 2004 study, Cornell University researchers found that Clear Channel Communications, the parent company of Clear Channel Outdoor, had a history of union-busting and violating federal labor laws. Those strategies “have had a negative impact on employment and labor standards in the industry segments where the company operates,” the report concluded. Given such anti-union history, last week’s announcement that L.A.-area unions would be lobbying city officials on behalf of Clear Channel’s quest to save its digital billboards from court-ordered extinction might strike many as a classic case of strange bedfellows. However, those who have seen union members pack City Council chambers in support of mega-projects like AEG’s Farmer’s Field and Hanjin International’s Wilshire Grand would hardly be surprised to learn that AEG’s Philip Anschutz has given significant financial support to anti-union causes, and that Hanjin International has been repeatedly accused of unfair labor practices in its native Korea. The announcement arrived in a press release from SignupLA, the centerpiece of a media and public relations push to convince politicians and the public that digital billboards provide essential support for business, jobs, public safety, and the work of non-profit organizations. Of the 101 digital billboards put up before the city called a halt four years ago, 99 are now shut off by court order, but Clear Channel has been lobbying hard for the city council to pass an ordinance allowing the signs to legally operate. In addition, other companies want to put up their own digital billboards, most notably Lamar Advertising, which has sued the city for the right to put up 45 new signs, and Regency Outdoor, which has threatened to sue if it isn’t allowed some digital signs. CBS Outdoor is the only other company with digital billboards now in place, but the great majority belong to Clear Channel. According to the press release, Clear Channel and Lamar have signed a Project Labor Agreement guaranteeing unions the work of erecting any new digital billboards those companies might be allowed to put up in Los Angeles and Orange Counties. Ron Miller, executive secretary of the Los Angeles/Orange Counties Building and Construction Trades Council, was quoted as saying that changes in technology mean that what worked for the outdoor advertising industry 50 years ago doesn’t work today. Also quoted was Kevin Norton, of IBEW local 11, who said that preserving existing digital billboards and permitting new ones will boost the city’s economy and its budget. That IBEW local is no newcomer to advocacy on behalf of digital billboards. 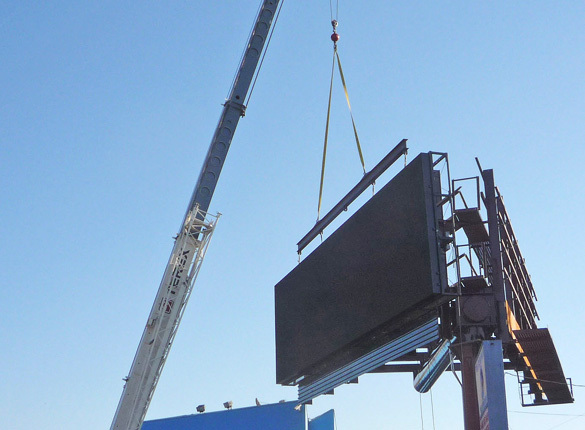 In 2008, when just over 100 digital billboards out of 840 allowed by city agreement had been put up, the City Planning Commission held a hearing on a moratorium on any more signs. Union members showed up in force, and one speaker who said he had recently completed his apprenticeship accused backers of the moratorium of trying to deny him his livelihood. Another reason for thinking Clear Channel and local labor unions might make strange bedfellows is the lineup of personalities and commentators on the company’s radio network. Most notably, these include Rush Limbaugh, Glenn Beck, and Sean Hannity, all of whom likely consider labor unions to be handmaidens of the devil, i.e., the Democratic Party and its liberal wing. Since the latter could describe almost all of the City Council, the sight of Clear Channel, unions, and city politicians all under the same sheet could be strange to behold, indeed.